The hollow core planks used are mainly 1200mm x 300mm x 12 metre spans. 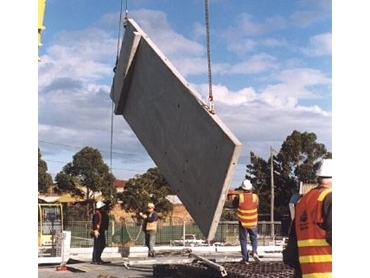 THE time between building design and delivery to the client can be shortened dramatically when precast components are used. An example is Shell House in Melbourne which is a Hudson Conway development. Hudson Conway chose the use of hollow core planks, columns, beams and lift shaft panels thus allowing the builder, Probuild Constructions, to achieve construction speeds of typically a 1000 square metres of hollow core plank flooring, columns and beams per three day interval. In total, the building will have 15000 square metres of hollow core planks, columns, and beams supplied to Probuild by Hollow Core Concrete . In addition, Hollow Core Concrete panels, 60 in all, are used for the construction of the two lift shafts. The hollow core planks used are mainly 1200mm x 300mm x 12 metre spans covered with a reinforced 100mm screed. Step-wise construction is being employed by Probuild to provide not only rapid erection but also access to other trades. There are advantages to the use of hollow core planks in construction projects. The hollow cores lighten the plank without affecting its strength and thus the overall weight of the structure is reduced. The elimination of formwork permits much earlier access to other trades than would otherwise be possible. Long spans of as much as 18 metres can be achieved providing a reduction in columns and improved space utilisation for parking and open plan offices, etc. The planks offer a high degree of flexibility to penetrations which can be located anywhere along the span and which can be as large as 37 per cent of the plank width. The construction method is economical in terms of material and labour costs. Savings relative to on-site concrete pour construction vary depending on the building design and functionality required. As an estimate, savings can be 15 per cent of on-site concrete pour costs.